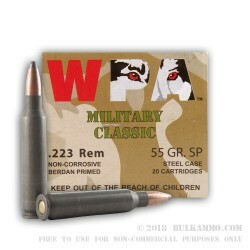 An awesome amount of value is contained within this .223 Remington load if you understand how to handle the unique proposition of steel cased rounds for semi autos and bolt action rifles. 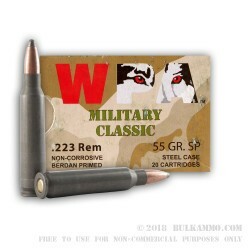 The main concern with these from a steel load perspective is that they shoot a bit dirtier than some other newly manufactured ammunition in .223 Remington, and therefore require a bit of diligence on swabbing the bore and chamber every few hundred rounds generally on tighter tolerance guns only. Other than that, they will perform flawlessly compared to other new ammo. The stigma that came with steel cartridge casings in “American” calibers has all but disappeared as the misinformation on the market has been gradually replaced by facts and as the American shooter has experienced the performance potential of the rounds as they became more accessible and more realistic given their obvious price savings over traditional loadouts. 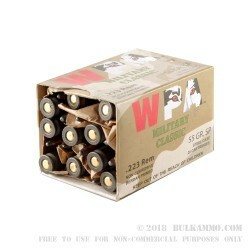 For the steel cartridges, this is one of the better loads available, with an excellent track record of performance and allows the shooter to use the round for everything from hunting to target shooting to home defense. The 55 grain projectile of this round is a soft point style. 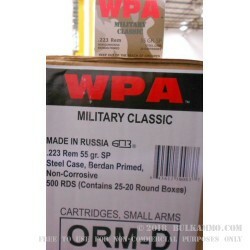 This is a non-reloadable cartridge for all intents and purposes.